I remember a time in my childhood when I would not eat my lunch if a banana was not served with it. My mother told me the same thing, how she used to boycott lunch if there were no bananas available. I outgrew that, but I still prefer to eat bananas with my lunch. Others have not and I have a brother, who to this day, brings his banana along when tackling rice for lunch. 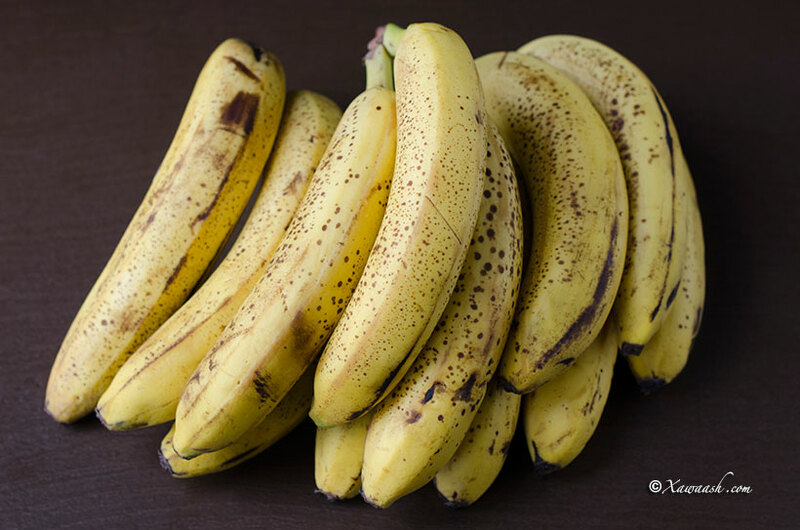 Bananas were one of the main exports of Somalia and during the harvesting season, they were in abundance in the southern parts of Somalia. The markets overflowed with bananas and there were piles upon piles everywhere. Prices were low and they were much lower at the end of the day when the stalls at the markets had to be emptied and vacated. There were also warehouses that sold only bananas and since none of them were air-conditioned or had refrigerators, the bananas quickly deteriorated in the tropical heat. We remember one such warehouse in Brava, Somalia that had so many bananas in various stages of deterioration. The bananas never went to waste and the Bravanese used to buy the very cheap bananas and dry the peeled bananas in the sun. Sun-dried bananas, known in Brava as mazalfoorno, were a favourite of ours and we used to snack on them whenever we could lay our hands on some. They were a healthy and nutritious snack. 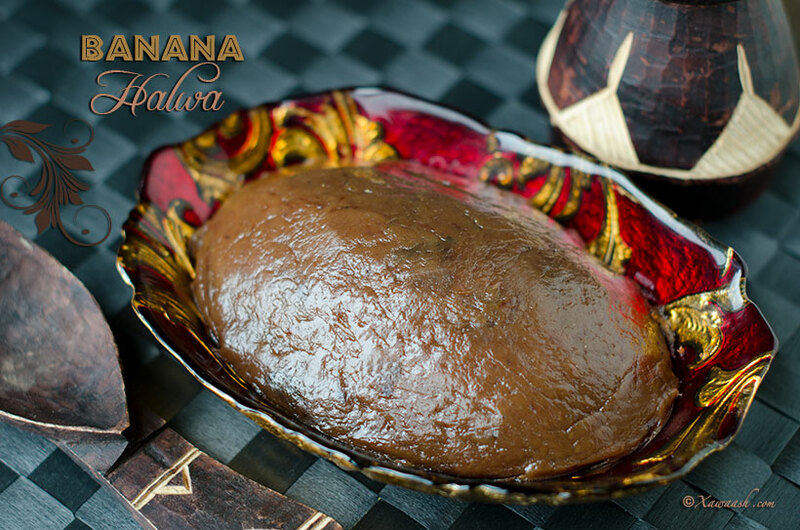 The Bravanese also used those very ripe bananas to make banana halwa. 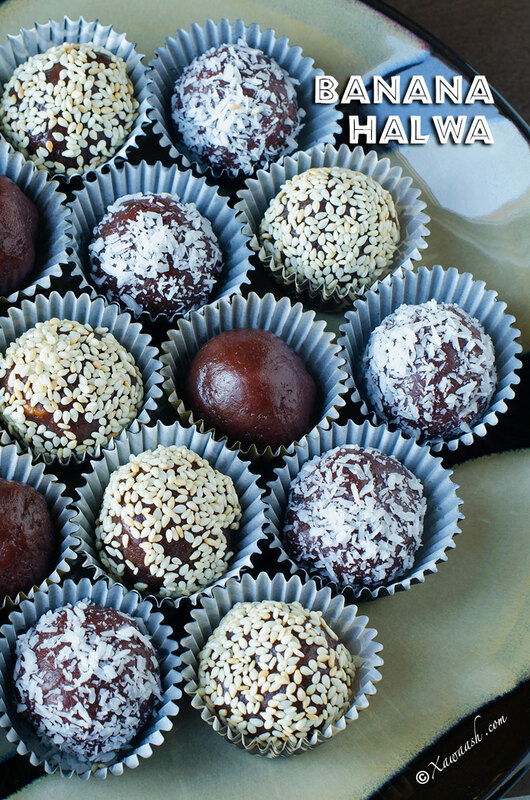 It is a delicious dessert that goes well with traditional unsweetened Somali coffee. The Bravanese know banana halwa as halwa ya mazu. The halwa was not shaped into balls but was made into a big chunk and everyone would rip a piece off of it. 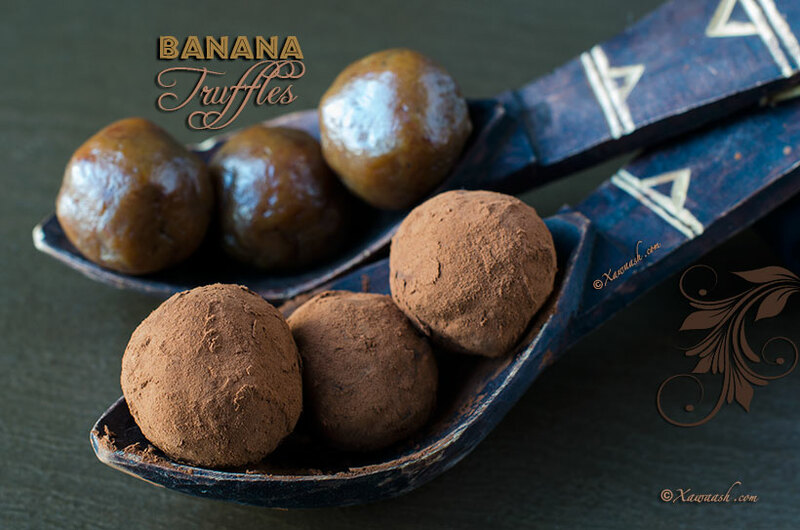 A chunk of banana halwa is not visually appealing which is why we decided to shape them into balls and coat them. The coating adds another flavour dimension which makes this delicious dessert taste even better. 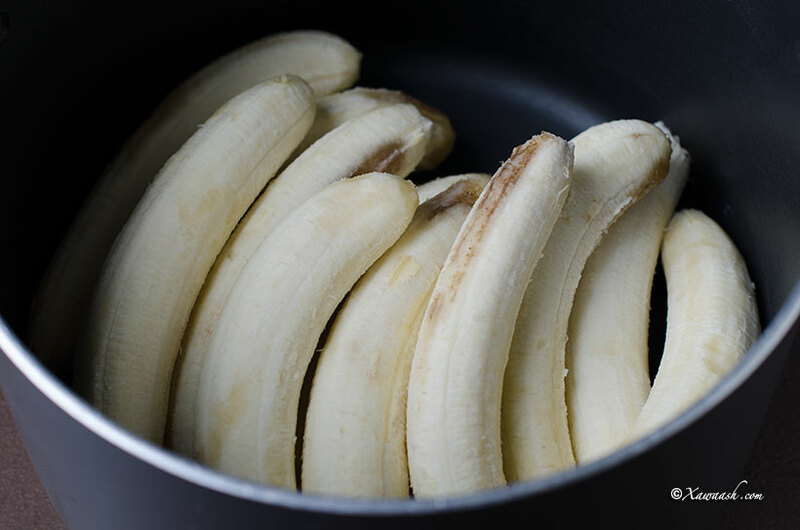 Peel the bananas then place them in a non-stick pot and mash them. Cook on medium heat for 30 minutes. Stir every 5 minutes. Cook for 10 minutes and stir continuously. Add the cardamom and cook for another 2 minutes. 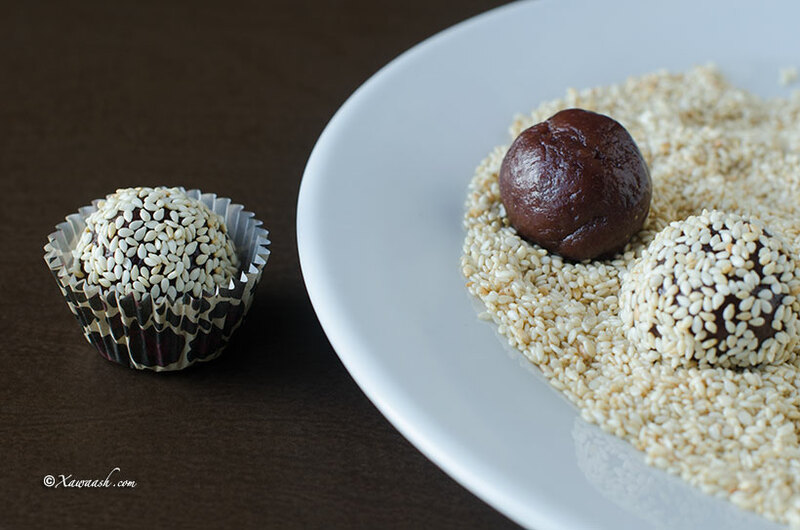 Serve with a spoon, or shape into balls and if you wish, stuff with nuts. 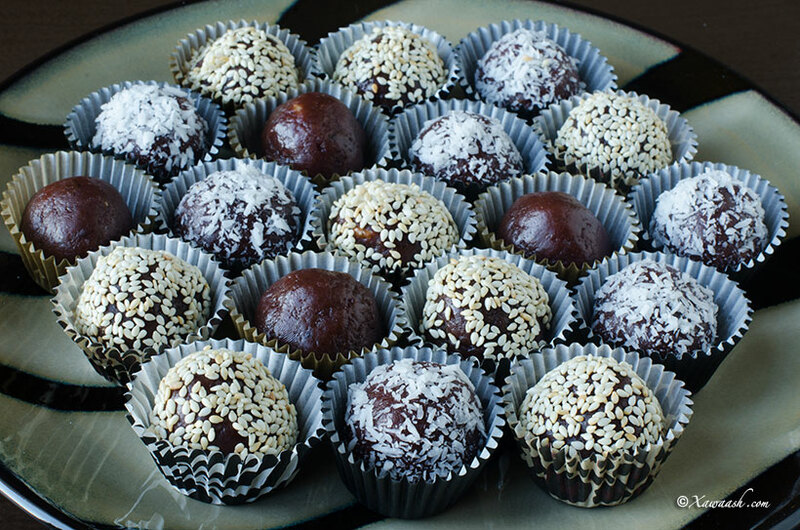 Roll them in ground nuts, sesame, shredded coconut or sweetened cocoa powder. Muuska fiiq, kaddibna digsi teefaal (nooca aan wax ku dhegin) ku rid ee burburi. Dab dhexdhexaad ku karkari muddo 30 daqiiqo. Walaaq 5 daqiiqo walba. Ku dar sokorta iyo buurada la dhalaaliyey. Kari muddo 10 daqiiqo, si joogta ahna u walaaq. Haylka ku dar, kaddibna kari muddo 2 daqiiqo. Sideeda qaaddo ku cun ama kuuskuus. Haddaad rabtid, laws dhexda ka geli. Korka waxaa ka marisaa, laws shiidan ama sisin, ama qumbe la xoqay ama budo shukulaato macaan. Je me rappelle d’une période de mon enfance où je ne mangeais mon déjeuner que siune banane était au menu. Ma mère m’a dit qu’elle faisait la même chose, elle refusait de manger son déjeuner s’il n’y avait pas de banane dedans. Heureusement ça m’est passé, mais je préfère toujours manger de la banane avec mon déjeuner. D’autres n’ont pas perdu l’habitude et j’ai un frère qui à ce jour, a toujours une banane avec lui pour manger son riz au déjeuner. Les bananes étaient l’une des exportations principales de la Somalie et pendant la saison de la récolte, elles étaient très abondantes dans les régions sud du pays. Les marchés étaient noyés sous les bananes et il y avaient des piles et des piles partout. Les prix étaient bas et encore plus bas en fin de journée quand les étals des marchés devaient être nettoyés et rangés. Il y avait aussi des entrepôts entiers qui ne vendaient que des bananes et comme aucun n’avait de climatisation ou de réfrigérateur, les bananes s’abîmaient rapidement à cause de la chaleur tropicale. Nous nous rappelons d’un entrepôt à Brava, Somalie qui était plein de bananes en train de s’abîmer. Les bananes cependant n’étaient jamais perdues et les Bravanais achetaient les bananes à prix très bas, et séchaient les bananes pelées au soleil. Les bananes séchées au soleil, appelées mazalfoorno à Brava, étaient nos favorites et nous en mangions autant que nous pouvions. Elles faisaient un goûter très bon pour la santé. Les Bravanais utilisaient aussi ces bananes trop mûres pour faire du halwa à la banane. Il s’agit d’un dessert délicieux qui va très bien avec le café traditionnel Somali non sucré. 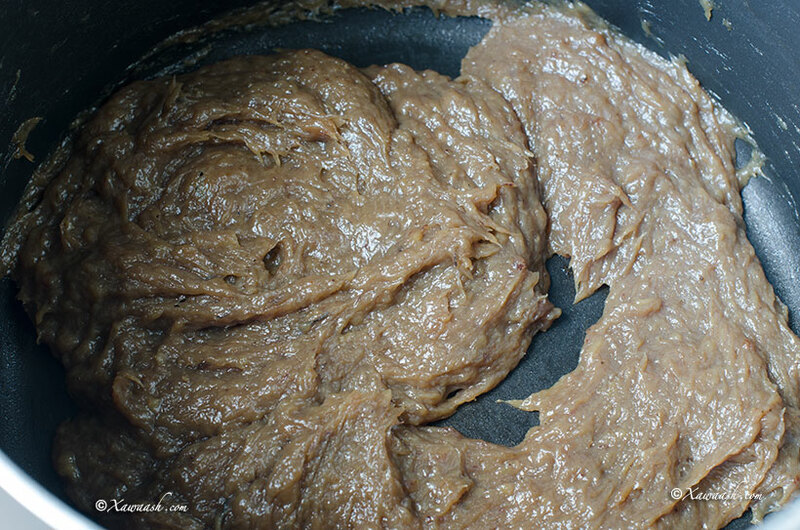 Les Bravanais appellent la Halwa à la banane, halwa ya mazu. La halwa n’était pas servie sous forme de boules, elle était présentée en un seul bloc et chacun en prenait un morceau. Un morceau de halwa à la banane n’est pas très joli à regarder et c’est pour cela que nous avons décidé de faire des boules et de les enrober. L’enrobage apporte une parfum supplémentaire ce qui rend ce dessert encore plus délicieux. Peler les bananes puis les écraser dans une casserole anti-adhésive. Cuire à feu moyen pendant 30 minutes. Tourner toutes les 5 minutes. Ajouter le sucre et le beurre fondu. Cuire 10 minutes en tournant constamment. Ajouter la cardamome et cuire 2 minutes de plus. Verser avec une cuillère, ou former des boules, fourrées au noix si vous le souhaitez. Rouler dans des noix écrasées, du sésame, de la noix de coco râpée ou du cacao en poudre. يقشر الموز ويوضع في قدر غير قابل للصق ثم يهرس. يطهى على نار متوسطة لمدة 30 دقيقة ويحرك كل 5 دقائق. يطهى لمدة 10 دقائق ويحرك باستمرار. يضاف الهيل ويطهى لمدة دقيقتين. تقدم وتؤكل بملعقة او تشكل على هيئة كور وتحشى بالمكسرات. تغلف بالسمسم او جوز الهند مجفف ومبشور او مسحوق الشوكولاتة المحَلى. waxaan maanta usoo galay inaa mahad balaaran oo aad u weyn inaa u helo bahda xawaash.com oo isku duuban oo mar walbo farxadeena iyo hormarkeena ka shaqeeyo hadaan ka mid ahay gabdhaha somaliyeed…runtii cunto karinta aad baa u jeclahay inaa barto cuntooyin kala duwan, xawaash la’aantooda wax badan ma barteen. Walaasheenna qaaliga ah, aad iyo aad ayaan ugu faraxnay faallada wacan aad inoo qortay. Waxaan kuu rajaynaynaa caafimaad iyo cibaado suuban. Mahadsanid walaal. Ramadaan Kariim. Waxaan rajaynaynaa inaad jeclaatid. Mahadsanid. Assalamo alaykum. That looks so yum and easy to make ! But if I want to make it more healthy, can I use coconut oil instead of butter, and raw organic sugar instead of white sugar ? Yes, you can use any type of oil and sugar you like. Asw aad ayaan idin salaamay bahda xawash.com. Hadduu Eebbe idmo waxaan samayn doonnaa bog ku saabsan ereyada cunto kariska ee lahjadaha kala duwan ee af-Soomaaliga. Mahadsanid. qeer ilaahay ha idin siiyo. maalmahan wax csub masoo gelisaan maxaa dhacay holidY MAA AADEEN? Adigaa mahadda mudan walaal. Waan ku faraxnay inaad ka faa’iidaysatay soo’daan. Mashruuc ayaan ku mashquulnay, hadduu Eebbe idmo waan soo gelin doonnaa. Mahadsanid. Thank you for your effort in presenting the Bravanese Somali recipe to the world. I just wanted to comment on one information in this post. 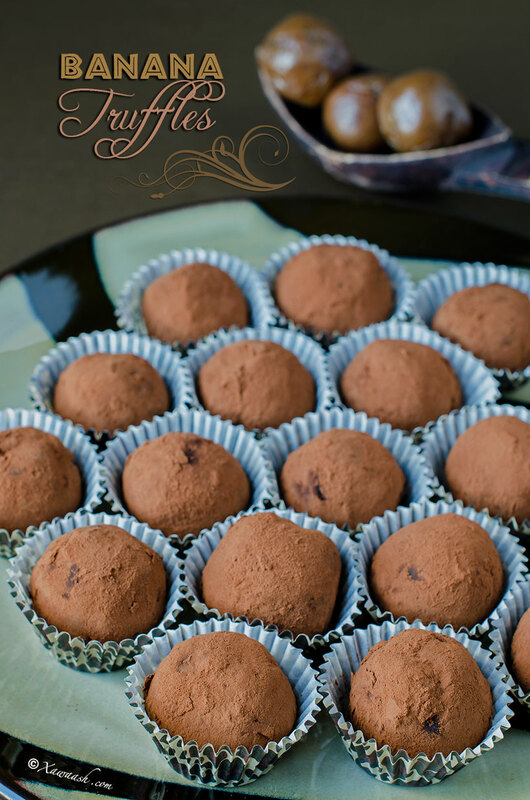 This was not the case in our bravanese house, they were actually shaped into balls but not coated. Thank you very much for your comment. We wrote the information based on our personal experiences; we understand others might have different experiences. Thank you very much for sharing that information and we hope you will give us your input on other aspects of Bravanese culture.